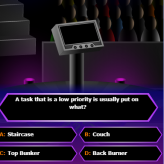 Play the popular TV game show right in the comfort of your cozy chair. Answer a set of 15 questions and become the next millionaire! Use your three life lines wisely and try not to cheat your way to the million dollars! 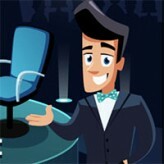 Millionaire is a flash quiz game based on the popular TV show “Who wants to be a Millionaire?”. 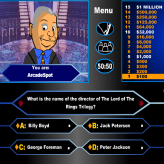 The game follows the same set of rules and features the same lifeline as the original TV game show. The life lines are: 50:50 that cuts your choices in half, phone a friend where you simulate a call with your virtual friend, and as ask the audience where the audience take a poll to help you. Try to get to the milestones $1,000 and $32,000, and aim for the million dollars! There have been 5,481 plays and 46 likes from 52 votes (89%) since 09/01/2010. 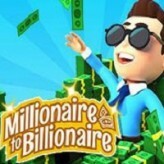 You are currently playing Millionaire game for free on Arcade Spot. It is a single game out of a variety of games that you can play on Arcade Spot. 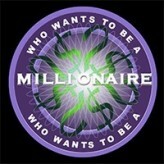 Play more games like Millionaire in the Challenge, Classic, Miscellaneous, and Trivia gaming categories. This game has a rating of 89 out of 100 based on 52 user ratings. If you enjoyed playing the game, give it a thumbs up. Free Online Games and Arcade Games are added every day. Arcade Spot will bring you the best games without downloading and a fun online gaming experience on the internet.